We'll meet at the Gateway Transit Center. Bus Riders Fee: $5 includes passenger with bicycle. Our bike ride then leaves from Cascade Locks back to the Gateway Transit Center following the old highway 30 bike path. 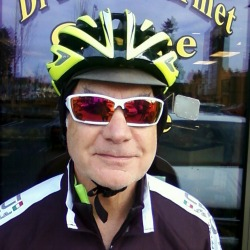 Our route will take us past Multnomah Falls, Crown Point, and Troutdale for a coffee break. Available space for two bicycles plus ride leader. Pace: 12-14 MPH.